I don't remember where my love for all things shiny began but it seems like I have always, always been drawn like a tractor beam to rhinestones, glitter, metallic fabrics, and sequins. I heart sequins so much I literally want to wear them everyday. And now I can! It took some trial and error (there are photos, you will not be seeing them) to discover a gentle mix of dazzling and dull. If you haven't noticed designers are loving sequins too this season. We have seen Marc Jacobs, Thakoon, and Phillip Lim glistening down the runways. Check how gracefully these outfits shine with just the right amount of sparkle. The key is mixing sequins with muted fabrics and tones. 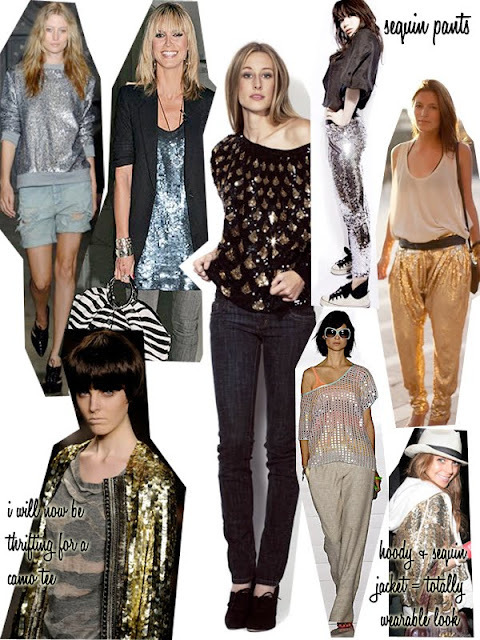 If you are wearing a sequin top, pair it with a pair of ripped jeans, or some khaki shorts. Let the sequins be the star of the ensemble. If an entire sequin top or jacket is too much for you, then try an accessory like a belt or a hat. Here are a few outfits I put together as everyday sequin wear. 1. Blue Sequin dress, Velvet (from UAL); Wool Jacket, Vintage; Boots, Vintage.